ISatori ISYMFS Review – Should you buy it? You’ve probably read some of our iSatori reviews on our website. iSatori is a good company that sells supplements that actually work on some level, and we’re always giddy to review any of their products. We particularly liked their best-selling product, Bio-Gro, and that’s why we checked out their pre-workout blend, ISYMFS. We have to admit that the name of the product was one of the things that drew our interest. ISYMFS was really a unique name for a supplement, and to our surprise, it has nothing to do with the science of its content whatsoever. ISYMFS stands for It’s Still Yo Mutha F’n Set! A little crass, don’t you think? But since you’re trying to convey the image that the product is a balls-to-the-wall pre-workout supplement, then ISYMFS isn’t really a bad name. In fact, it’s quite apt, don’t you think? Like most pre-workout supplements, iSatori ISYMFS contains stimulants, which is primarily caffeine. It contains a total of 375 caffeine (300mg anhydrous, 75mg citrate) and 25mg Theacrine, which is just about as identical as caffeine. These two ingredients promote focus and energy for the user – something that every individual who wants to intensify their workout wants. Pre-workout supplements like iSatori ISYMFS are used by people who are looking for that extra kick in their workout to improve performance and speed up muscle mass development. The idea is to give the user an advantage by increasing energy, focus, and stamina to endure longer, more intense workouts. 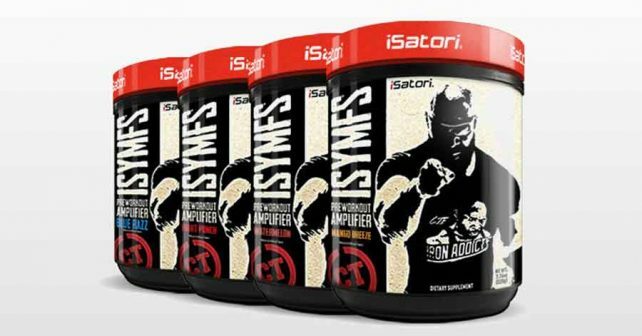 In case you’re wondering, CT Fletcher is the brand ambassador for iSatori ISYMFS. Talk about the best people to advertise your PWO. We’ve reviewed a couple of other pre-workout supplements before, and we’ll compare iSatori ISYMFS based on the products that we found to be effective. A total of 400mg in stimulants (caffeine+theacrine) is a little bit too much for one person to tolerate in just one dose. It’s the equivalent of taking three Venti brewed coffee servings at Starbucks in just seconds, and you can very well tell that the experience won’t be lovely. You can probably try taking half doses, but that also means that you’re sacrificing the good part of the formula – the ones that you don’t want to cut in half. iSatori ISYMFS contains Carnosyn, Creatine, and Betaine Anhydrous – all in within range of the appropriate dose to take per day, which makes it almost a complete PWO if not for the overload of caffeine. It also contains L-Tyrosine which can improve your mood and help you stay focused during workouts. In any case, iSatori ISYMFS appears to be an effective product, but the overkill on caffeine may simply be too much for recreational athletes and bodybuilders. There’s so much that goes on in a formula of iSatori ISYMFS, and that’s awesome. It’s just sad that you might end up halving your dose just to take it within your tolerance. I would only suggest iSatori ISYMFS if you’re particularly caffeine tolerant. In any other case, I would suggest taking the best muscle building supplements like NitroGenix 365 instead.